Preheat the oven to 375F. Heat the vegetable oil and the olive oil. 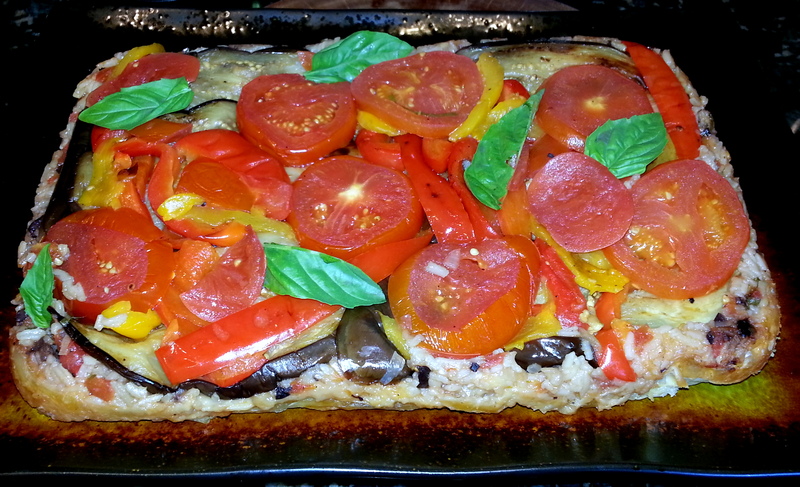 Add the eggplant slices and cook over a medium heat for 4-5 minutes on each side. Drain on kitchen paper and season with salt and pepper. Add the pepper strips to the remaining oil in the pan, turning them to coat. Cover the pan with a lid and sweat the peppers over a moderately high heat for 5-6 minutes, stirring occasionally, until the pepper strips are soft and lightly brown. Season with salt and pepper. Slice two of the tomatoes and set them aside. Place the remaining tomatoes in a bowl, cover with boiling water and leave for 30 seconds, then drain and peel them. Cut them into quarters and remove the cores and seeds. Chop the tomato flesh coarsely. Heat the remaining oil in the frying pan. Add the shallots and garlic and cook over low heat, stirring occasionally, for 3-4 minutes, until softened but not brown. Then add the chopped tomatoes and cook, for a few minutes, until just softened. Stir in the white wine and basil and season with salt and black pepper to taste. Bring to the boil then remove the pan from the heat and stir in the cooked rice and black olives. 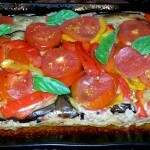 Arrange the tomato slices, the eggplant slices and the peppers in a single layer on the base of a heavy, 12” shallow ovenproof dish. Spread the rice and tomato mixture evenly on top. Roll out the pastry to a round slightly larger than the diameter of the dish and place on top of the rice, gently tucking the overlap down inside the dish. Bake for 25-30 minutes, until the pastry is golden and risen. Leave to cool slightly, then invert the tart on to a large, warming serving plate. Serve in slices with a side of salad.